Orient have played football at Brisbane Road since 1936, taking the ground over from Leyton Amateurs, financial restraints meant that the football club didn’t start developing the ground till the early 50’s when a new Main Stand was erected, the stand was bought from a South London greyhound stadium but only partly erected, not being fully finished till 1962. The picture below, taken from a 1970s Football Review magazine, shows the gable in the middle of what was the original two thirds of the stand (erected in 1956) which apparently used to hold the photo finish cameras for the greyhound racing, not of much use at football grounds so hence the blocked off finish !! 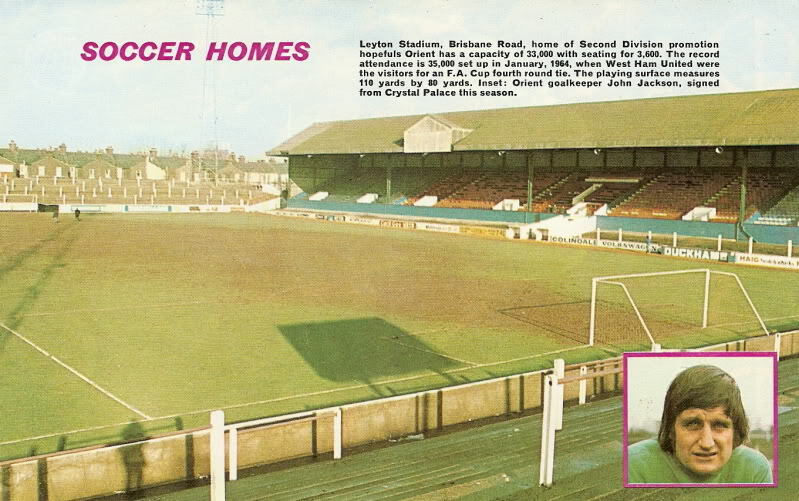 "Leyton Stadium, Brisbane Road, home of Second Division promotion hopefuls Orient has a capacity of 33,000, with seating for 3,600. The record attendance is 35,000 set up in January, 1964, when West Ham United were the visitors for an FA Cup fourth round tie. The playing surface measures 110 yards by 80 yards. Inset: Orient goalkeeper John Jackson, signed from Crystal Palace this season."